More than one-third of the state's tamaracks have died since 2000. 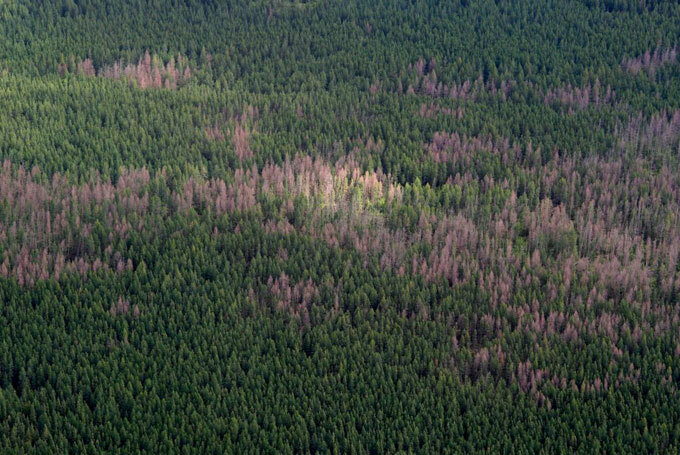 A 2007 aerial view of widespread damage in tamaracks from an outbreak of larch beetles in northern Minnesota. Credit: Marc Roberts, USFS. Since the year 2000, more than a third of Minnesota’s tamarack trees have been killed. The culprit is the tree-burrowing eastern larch beetle. It’s native to the U.S., but it’s now causing unprecedented damage. Brian Aukema, of the University of Minnesota, says that a dramatic shift in the beetles’ life cycle is largely to blame. Historically, young beetles would hunker down for the winter on the tree where they had hatched. The following spring, they would fly off for the first time, reproduce, and attack other trees. But now, Aukema says in some years, warmer temperatures and a longer growing season are allowing some young beetles to go through that whole process in a single season. This means they are multiplying faster and wreaking more havoc on northern forests.